Elementary school principals Verniece Rorie of Gale-Bailey, Orlena Whatley of Dr. Samuel A. Mudd and Sabrina Robinson-Taylor of Walter J. Mitchell keep working while talking with Kelly Caplan of Washington Gas and Superintendent Kimberly A. Hill. LA PLATA, Md. 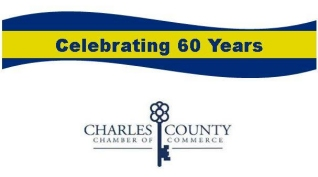 (December 26, 2018)—Charles County Public Schools (CCPS) principals recently worked a little magic during their monthly meeting when they were tasked to work in teams to build 40 children's bicycles. 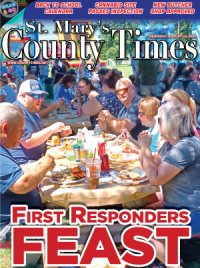 "We know how important it is—taking care of the family we have made with our students and school communities," said Amy Hollstein, deputy superintendent of schools. Principals broke into groups of three to put together a boy's and a girl's bike. 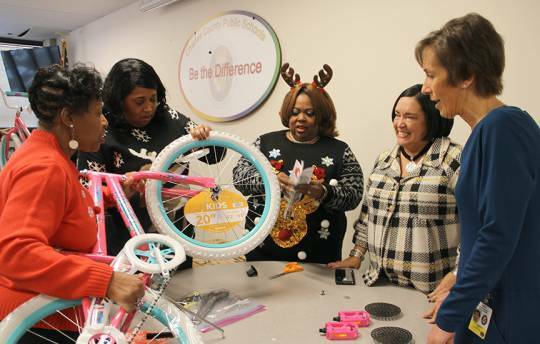 Once complete, the bikes were inspected by CCPS staff and each of the county's 21 elementary schools received two to give out to needy students. Hollstein and her team came up with the idea for the bike building activity with principals foregoing their annual holiday gift exchange to instead donate a bike accessory—fun license plates, helmet, spoke reflectors—to the project. Hollstein pitched the idea to Superintendent Kimberly A. Hill, who was enthusiastic about the project. But it wouldn't be cheap and there was no wiggle room in the budget to buy 42 bikes. Enter Kelly Caplan, community outreach manager for Washington Gas. Caplan and Hill met at a community event and with the gas company's philanthropic outreach efforts focused on health education and the environment, the bike project fit right in. "It was an easy 'yes,'" Caplan said. 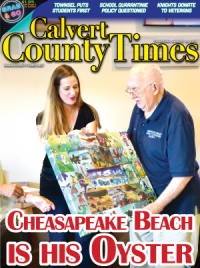 "You guys work so hard to take care of the incredible children in Charles County," Caplan said to the principals. "For children to have bikes—that's a big deal. And you guys all working together? I think it's going to be a labor of love." "I thought it was wonderful," said Sabrina Robinson-Taylor, principal of Walter J. Mitchell Elementary School. "First of all, to be able to provide an opportunity for students to receive the bikes and then to be able to work collaboratively with colleagues as we try to figure out how to put a bike together."